The combination of honey and lemon brings out the natural flavour of the figs. If you are using bamboo skewers, soak them for at least 20 minutes first to avoid burning. Chop one of the lemons into about 12 pieces. Grate the rind and squeeze the juice from the other one. Thread the fig quarters alternately with the lemon chunks and bay leaves onto skewers, starting and ending with a piece of fig. Melt the honey with the lemon juice in a small pan and bubble for 3-4 minutes, until reduced by about a half. 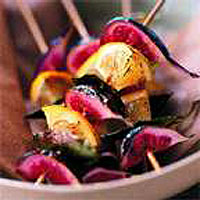 Arrange the fig kebabs on a grill pan and brush with a little of the hot honey mixture. To make the lemon tzatziki, combine the yogurt with the grated lemon rind and place in the fridge. Preheat the grill. Place the kebabs under the grill until the edges of the fruit begin to caramelise a little, turning once, but for no more than 2-3 minutes a side. Serve immediately, trickled with the rest of the honey, with the tzatziki on the side for dipping.